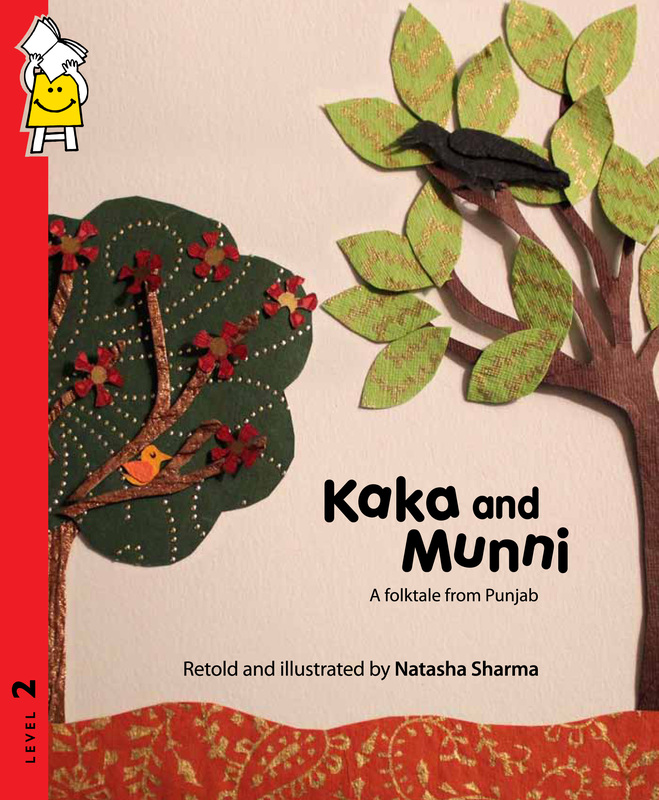 Kaka and Munni is a retelling of a popular folktale from Punjab in India. The village bully, Kaka the wicked crow, wants to eat Munni’s eggs. However, Munni is a clever sparrow as are all the other characters in this story that is written in prose and verse. The story is illustrated in a collage style using handmade papers with Indian design motifs. The colours, the paper motifs and the textured treatment takes you to a village in Punjab from its wheat fields to its bubbling streams. “…So here’s a refreshing look at a folktale from Punjab retold and illustrated by Natasha Sharma. Her storytelling is straightforward and the language is simple. The sentences are not too long and the dialogues sound like day to day conversation. The story is depicted with some very interesting collage work. The intricate design on the paper which looks like folk art in places lends itself perfectly to the folktale, making it complete. The collage art for the illustrations are well composed and so are the stylized paper cuts of animals, birds and scenery. The colors are soothing, refreshing and stand out very nicely against the white paper. Folktales will never lose their charm and can always find their way into the hearts of children even today when storytellers like Natasha add some uniqueness to them. So here is a visual treat for kids and parents alike who like folktales. This is a harmoniously written and designed book….” – Savio Mascarenhas, Art director Tinkle magazine. “I enjoyed the rich, vibrant colours of the illustrations in this book, and the innovative way scale has been played with. The lively mix of textures, prints and colours makes each page a pleasure to pore over, even rub with your fingers. I did feel sorry for poor Kaka, though!